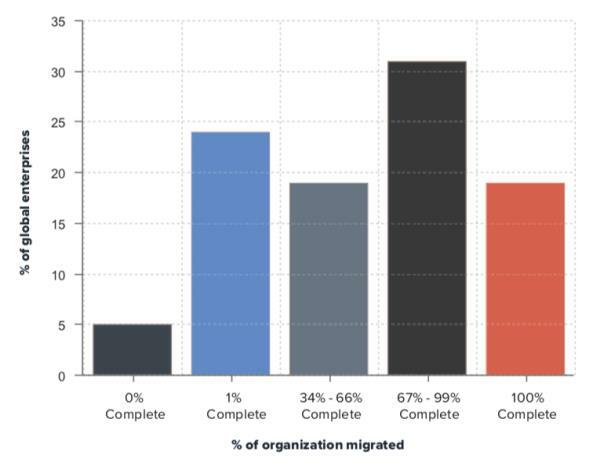 When asked how much of their organisation has successfully migrated to Windows 10, less than 20 per cent of all those surveyed said it was 100 per cent completed. With exactly one year to go until Microsoft ends support for its ten-year-old operating system Windows 7, as many as 43 per cent of enterprises are still running the outdated platform. That's according to the Death of Windows 7 report from enterprise content delivery firm Kollective. The study examines the potential costs and security threats involved in staying on Windows 7 after Microsoft's support deadline passes. It was conducted by independent research company Censuswide which surveyed 260 IT decision makers – 130 based in the US and 130 in the UK. Of those polled in the UK, Kollective found that 38 per cent of businesses are still running Windows 7. It revealed that 13 per cent of IT departments don't know when the end of support deadline is, while seven per cent are aware of the end of support but have yet to start planning for their migration away from Windows 7. According to Kollective, those that remain on the system past 14 January 2020 will either have to pay Microsoft significant sums for extended support or else leave themselves open to cyber attack. The company goes on to warn that in the case of the largest enterprises which have 10,000 or more terminals, the fee to Microsoft could be in excess of $1.4m a year. Kollective adds that perhaps most worrying of all, 17 per cent of UK businesses admit to still running Windows XP and Windows Vista on some of their machines. That's despite support for these operating systems having ended more than three years ago. Kollective CEO Dan Vetras says the findings should be a major cause for concern among the business community. "When it came to migrating away from Windows XP, it took some large enterprises as long as three years to transfer their entire systems to the new operating system. Now, many firms will have to make the transition [from Windows 7] in less than 12 months. Most worryingly, Vetras points out that this migration is just the first step. "Once businesses are on Windows 10, they will need to continuously update their systems as part of Microsoft's new "Windows as a Service’ model. By running a software-defined content delivery network over their existing infrastructure, Kollective believes businesses can dramatically speed up their networks without having to rip out and replace existing hardware. It says this can also "massively" increase the reach and quantity of updates, helping to future-proof businesses for Windows 10 and XaaS operating systems.